The art of retouching photos has come a long way since the Soviet used crude cut-and-paste techniques to remove unwanted people from black and white shots in the Fifties. These days, even the most basic photo editing software is capable of performing sophisticated alterations on all kinds of images. Snapheal 1.2 (Mac App Store link) is one such tool, but with a twist: it’s designed to allow users to selectively alter parts of an image by tweaking its technical parameters, adjusting exposure settings, and removing unwanted features. Let’s start with the latter, which is a modern equivalent of the old Soviet edit jobs. Once you load an image in Snapheal, the app gives you three different tools for selecting a specific area, which can then be excised using several algorithms that replace it with content cloned from elsewhere in the photo. As you can imagine, this tends to work well when you try to remove subjects against a uniform or abstract background like the sky or a sandy beach. The app fares particularly well when it comes to removing overhead wires against the sky—a quick and easy way to greatly enhance the look of many photos. The other tools offered by Snapheal are similar to those you can find in most photo-manipulation programs, such as iPhoto. However, because the app allows you to apply them selectively to specific areas of the app, you have absolute control over the final look of virtually every pixel, and makes it possible to create “hyperreal” pictures in which individual elements are tweaked using different settings. 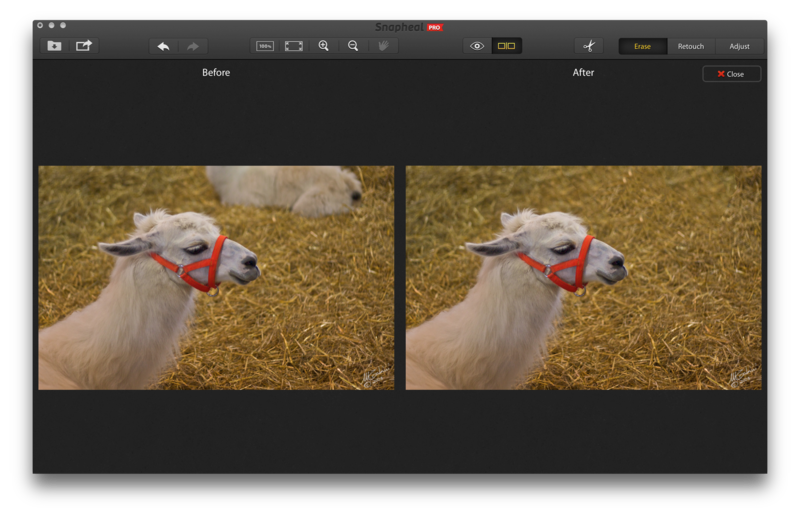 Snapheal comes in two versions: a $15 Basic edition that is available on the Mac App Store, and a $40 Pro edition that can only be purchased through the developer’s website. The latter offers more sophisticated and precise image manipulation algorithms, but both are excellent tools for photographers of all skill levels.